LONDON (Reuters) – Hitting a hot streak at the right time will be the goal of golf’s top male professionals this year as a new calendar crams the major championships into a super busy four-month stretch. The PGA Championship has switched from its traditional mid-August timeslot to mid-May, which will force players to focus like never before on trying to peak between April and July. Starting with the April 11-14 Masters at Augusta National, the majors will come thick and fast, with the PGA Championship at Bethpage from May 16-19, the US Open at Pebble Beach from June 13-16, and the British Open at Royal Portrush from July 18-21. That’s four majors in 15 weeks, which could be bad news for players who have a form dip at the wrong time, but conversely will allow those in good form to strike while the iron is hot, so to speak. The major venues will certainly have Tiger Woods salivating as he tries to end his decade-long major drought streak. He has won four times at Augusta National, once at Bethpage (2002 US Open) and once in a major at Pebble Beach (2000 US Open), where he produced the greatest performance of his career, a record 15-stroke triumph. He has never triumphed at Royal Portrush, but then again neither has any other active player, because the classic Northern Ireland links has not hosted the British Open since 1951. While Woods, who turned 43 on Sunday, usually guards his schedule as closely as a state secret, you can bet the house on where he will play once the majors get started. His successful 2017 spinal fusion allowed him to play a full schedule in 2018, but he says he overdid it at times and will be sure to pace himself better in 2019. This means his regular PGA Tour appearances during the majors stretch could be limited to the May 2-5 Wells Fargo Championship in Charlotte, North Carolina, and the May 30-June 2 Memorial tournament in Dublin, Ohio. 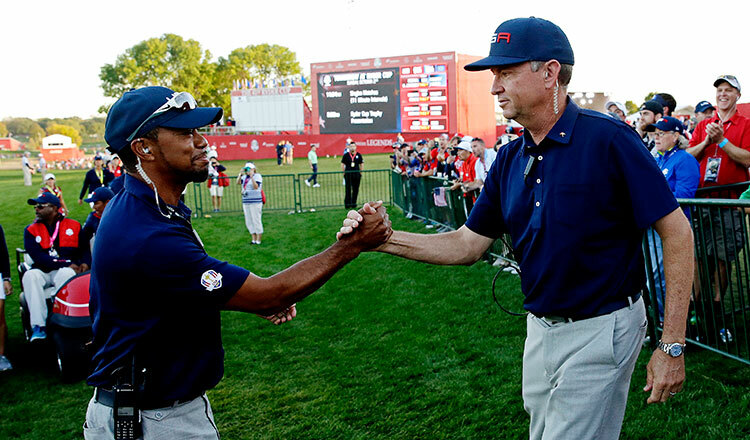 These events both fall two weeks before a major, which is the way Woods has traditionally prepared for the big ones. A new tournament in Minnesota, the 3M Open, might also benefit from its slot in the schedule two weeks before the British Open. Woods has the all-time PGA Tour record in his sights in 2019, while it will also be a most important year if he ever hopes to catch Jack Nicklaus’ record of 18 major championships. With 80 PGA Tour victories, Woods is two short of Sam Snead’s mark, while his 14 major titles leave him four short of the Nicklaus mark. Golf has no shortage of good young players, many already proven winners at the highest level but still with much to prove. Rory McIlroy has four major titles, but has not won one since 2014. Questions are being asked about whether his wedge game is consistent enough. Three-times major winner Jordan Spieth will try to bounce back after losing his putting mojo in 2018, while Dustin Johnson at age 34 needs to get cracking if he wants to add to his solitary major title before Father Time catches up with him. Super-talented Tony Finau, until now best known for turning an ankle while celebrating a hole-in-one at the Masters par-three competition last year, seems poised to become the next genuine star. He did not win in 2018, but came close several times and once the floodgates open there might be no stopping him. And keep an eye on Cameron Champ, probably the longest hitter ever to play the PGA Tour. The 23-year-old set an all-time distance record with an average drive of 343 yards in the secondary Web.Com Tour last year, 10 yards longer than anyone else. Champ is anything but a one-trick pony, however, already a winner this new 2018-19 season at the Sanderson Farms Championship and quickly following up with two more top 10s. Another worth watching is 20-year-old Chilean Joaquin Niemann, a former world number one who has made a solid start to his professional career. In the women’s game, the female equivalent of the Ryder Cup will take place at Gleneagles in Scotland in September, when the United States and Europe face off in the Solheim Cup. But unlike men’s golf, in which nearly all the top players are European or American, the Solheim Cup will include only two of the world’s top 10 players, based on the current rankings. Asian golfers continue to dominate women’s golf, with South Korea supplying a never-ending conveyor belt of talent. But the world number one ranking belongs to Thai Ariya Jutanugarn, the reigning U.S. Women’s Open champion, who will start 2019 as the woman to beat. The new year also ushers in the most widespread rules changes in decades, designed to make the game fairer, faster and simpler. At the recreational level, at least, it is more a case of the rules catching up to what many casual players have been doing for years anyway.